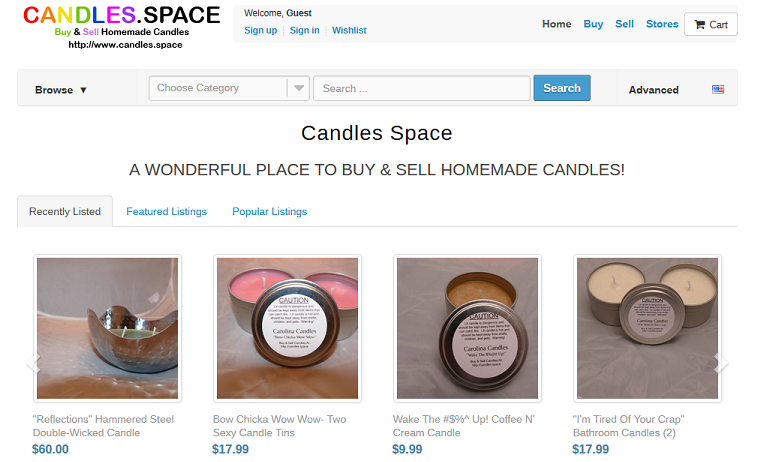 Candles.Space: Buy & Sell Handmade Candles! | CraftyGirl Creates CraftyGirl Creates: Candles.Space: Buy & Sell Handmade Candles! Home » buy candles » candles » Candles.Space » handmade » sell candles » Candles.Space: Buy & Sell Handmade Candles! Candles.Space: Buy & Sell Handmade Candles! More & more online venues to buy & sell handmade items are opening lately - It's great to have so many options! I really love seeing websites that are niche specific, making it easier to find exactly what you want. One new website that I want to showcase today is Candles.Space, an online site specializing in handcrafted candles & accessories. If you love buying candles, or if you're looking for a new site to sell your handmade candles on, I really suggest that you give Candles.Space a try! Right now, Candles.Space is offering an EXCLUSIVE coupon code on any Carolina candle - NC20 - for 20% off plus FREE shipping on any order over $100! If you're looking to sell candles online, Candles.Space is a great option. It's FREE to open your online store, and has low fees, including a small 5% commission on sales. Free SVG files from Chicfetti!